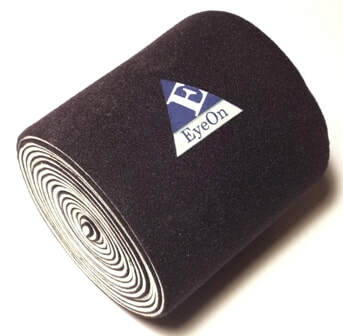 EyeOn Equine Care far infrared compression & support bandages are for horses and ponies. The proprietary EyeOn Technology far infrared compound is embedded into medical grade, non-slip, breathable foam to provide all the benefits of far infrared energy plus a defined compression and support therapy system that facilitates the natural thermoregulation of heat. The state of the art composite material combines open-celled, elastomeric, non-latex foam with selected high quality and specifically engineered, breathable fabrics. This unique composite was developed for use by various medical professionals, including, physicians, physical therapists, certified athletic trainers and related health care providers. The combination of a breathable, compression and support system with all the benefits of far infrared energy is unsurpassed when it comes to injury prevention and faster healing. Bone chips in hock caused inflammation that EEC wraps resolved. Wraps only used when needed now to control swelling. A bone chip in a hock that broke up into smaller pieces that according to the vet would cause persistent inflammation. Wrap used overnight in stall, never migrated. Horse is being ridden again. "The barn owner and trainer was so pleased with the results after just 7 hours that she put them back on the next day while Amora was in her stall. She said that after only two uses, "Amora's leg has never looked better." Unionville, PA horse with two stocked up legs had an EEC infrared wrap placed on ONE leg over cotton and over night by the owner interested in learning if she could see any difference. EyeOn Equine Care products absorb heat waves and transforms them into far infrared energy with wavelengths that slightly overlap those absorbed and given off by animals and people. Support & healing acceleration after operations, immobilization, etc. "After 48 hrs, the swelling in the front legs prior and after training was significantly reduced and on palpation, the tenderness seen was also reduced---the horse also trained better by day 7 and did go on to qualify and raced well 10 days later. The trainer also kept the horses legs wrapped on the trailer ride to the races with the EyeOn until warming up and after the races prior to loading up for home would reapply them--the horse continues to improve." ​Veterinarian Sergio Botta who worked for Paul Schockemöhle Pferdehaltung GmbH and in Europe during the summer of 2016 was the first to use EyeOn wraps on one of US USET jumpers. "For sure they work, and it makes a difference when Vita had them on. These wraps are magical!" ​Charlie Myrick Racing Stable, Inc. I would recommend that anyone that has a horse with a soft tissue problem give these leg wraps a try and I think you will be pleasantly surprised with the results. 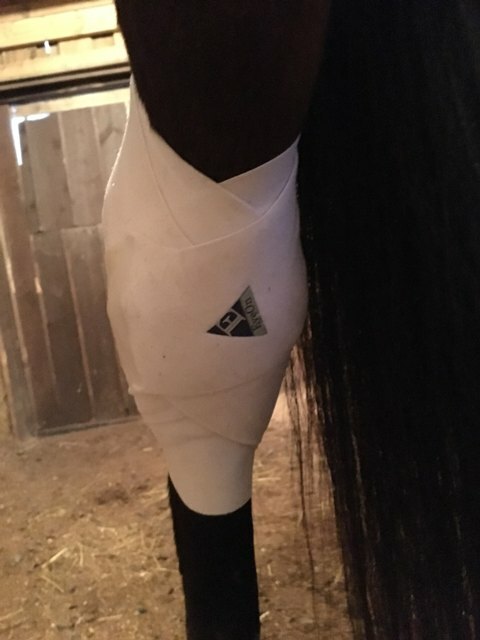 I used the EyeOn Technology leg wraps on a 7 year old standardbred race horse that I had in training that had a chronic high suspensory issue on a hind leg. I had to have continual Veterinary work done on this leg to keep the horse sound enough to race. I read about your leg wraps and decided to give them a try and after about two weeks of keeping his legs done up in only your leg wraps I saw a 80% improvement in his ability to function on the track. Robert S, Wellington, FL featured as a horse whisperer in The Chronicle of the Horse. "Our jumper's leg started to blow up and fill with fluids after competitions. The vet scanned the horse with ultra-sound and said it wasn't a bowed tendon, just fluid and swelling. I've been using the EyeOn products and had very good experiences with them. I decided to try EyeOn wraps and wrapped the leg just before noon and removed them the following morning around 7:30. The swelling was completely gone and I found no need to use any other medication. There was no sweating either." "EyeOn worked on me, the dog and horses. There is no other product that works as well as this!" *EyeOn compound embedded directly into foam! *Long Lasting, won't wash out! Icing Still Valid?Visit the Equine Info Exchange link to Is Icing Still a Valid Treatment for Injuries?